Select a January Sales Offer!! Looking Forward to Helping you Grow your Business in 2017. 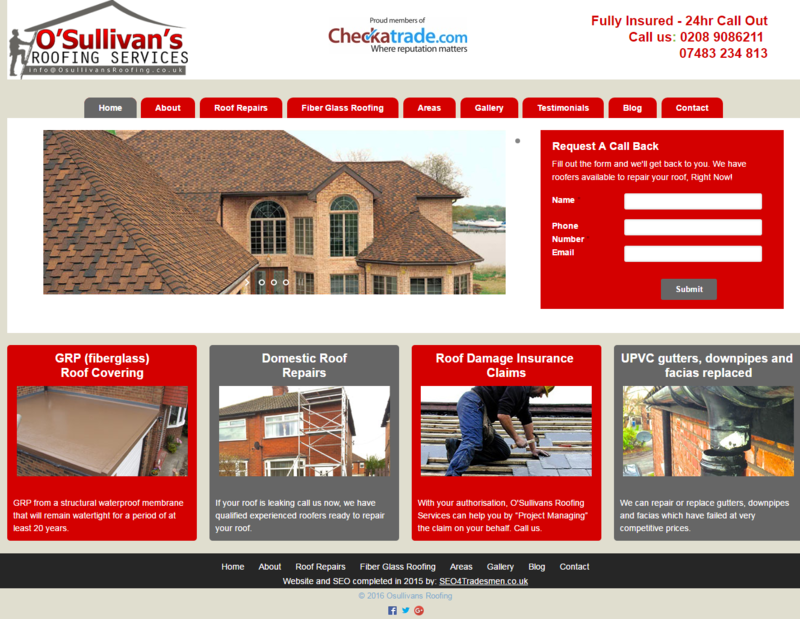 O'Sullivans Roofing on page 1 of Google 3 times!! O'Sullivans Roofing now appears 3 times on page 1 of Google for his searches!! They are so busy with work! Fantastic!! 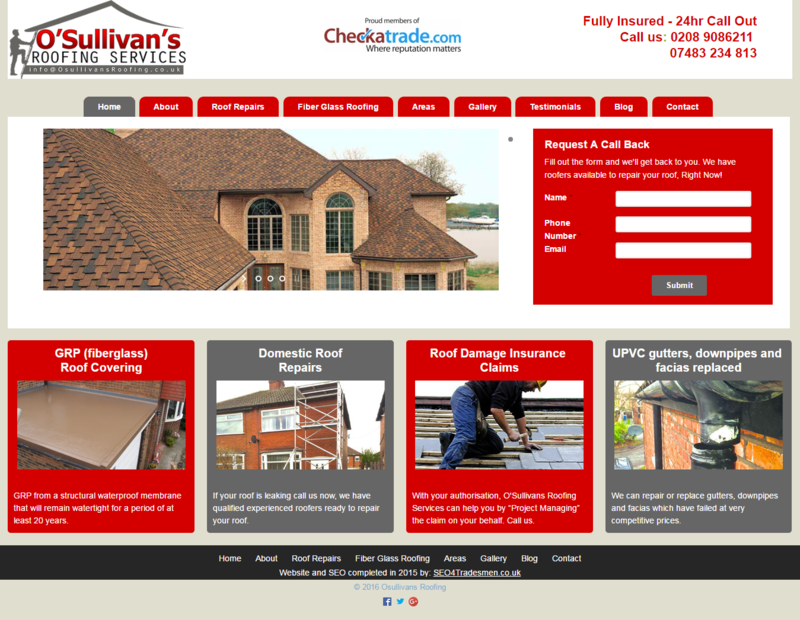 SEO4Tradesmen welcome's O'sullivans Roofing to page 1 of Google. Here is their ranking report. We can do this for your business. Get in touch today, and before you know it you can be on page 1 of Google for all your relevant Key Phrases (e.g. roofers wembley) and getting the most enquiries for your business. SEO for Tradesmen: Let's Get You Started! Today, SEO services are high in demand. They provide tradesmen with the chance to build a great reputation within their field of work. Nearly every business has an online presence nowadays. Tradesmen who are very serious about creating brand familiarity and awareness have websites and webpages that they are using to reach their customers. However, thinking that having an active online presence is dependent on only having a good website is completely wrong. SEO for Tradesmen; Can it improve your business? Ranking in the top positions of the search engine results can have a significant impact to your business as traffic for your website increases. These pages that are in the top ranking get a majority of impressions, clicks and views. Additionally, SEO services concentrate on creating relevant keywords and meta descriptions, which appear in the result pages. Click through rate is normally increased by having optimized descriptions and tags. Whether you are an ecommerce or a non-ecommerce business site there are no doubts when it comes to the return on investment. SEO for tradesmen offers traceable and measurable results. Professionals have the ability to track and analyze nearly every feature of their strategy, for example; traffic and conversions. SEO is one of the most cost effective platforms in marketing for tradesmen. This is because it specifically targets users who are actively searching the web for your products and services. It helps most businesses save money. As a tradesman, the first step is to ensure that your website is easy to navigate for the search engines. At the same time, SEO also makes your site easy to navigate as well. It rearranges the site’s framework and links so at to make the pages within the site easier to find. This makes it simple for users to find any information on your website. If you want more exposure for your products and services, all you have to do is ensure that your website appears in the top positions of the search engine results page. Furthermore, appearing on the first page for your specific targeted keywords helps users identify your brands in relation to the keywords. It also builds trust, especially since businesses that appear on the first page are normally perceived to be more legit. Most tradesmen like to find effective and productive ways to reach their customers and clients. This is why they spend most of their time and resources to make their websites better in every way. However, some never get to achieve their goals because they do not know about optimization. In order to avoid making any costly miscalculations, the reasonable thing is to seek the services of a company that can provide the best SEO for tradesmen sites. The dawn of the digital age brought with it changes in the way we work, play, and interact with each other. For tradesmen, reliant on making positive contact with their customers and clients, keeping up with the pace of a rapidly morphing environment, therefore, became a matter of survival. Simply put, in today's’ economic climate the motto is: Adapt or die. This is where Search Engine Optimization (SEO) comes in. Effectively the most efficient customer-netting facility in existence today, effective SEO implementation is the gold-dust of the digital rush. Now, as a tradesman, expect to encounter many companies seeking to cash in on your efforts by selling you packages that give minimal and unfocused customer reach- the kind that will have hopeful potential clients calling you up from hundreds of kilometers away, far out of your reach, and nobody enjoys disappointing a customer in need. Focused, localized SEO Tradesmen will have your details and contacts showing up in search engine results for the people you are best positioned to serve, reliably providing that all important link between you, the Tradesman, and them, your valued customers. So, keep your wits about you when selecting an SEO provider; tailor-made solutions will always make for the best fit. SEO for Tradesmen: Is It Worth it? It's no secret these days that having a strong Internet presence can help your business tremendously. Many people, when looking for a local carpenter, plumber, or electrician, will use Google as their first resource. Gone are the days of searching through the yellow pages. What search engine optimization (SEO) is all about is knowing what exactly your potential customers are typing in (the keyword) and then optimizing your page so it comes up higher in the search results. Not many will go through pages of search results; they'll click on whatever comes up first. Given that so many people use the Internet these days, do you think SEO for Tradesmen is a worthwhile investment for your trade business? The answer is absolutely yes! There is no way that building and optimizing your website can't help you. It will get the name of your business out there, on peoples' minds, and get it shared. An additional benefit to SEO is that the more people talk about your business, the higher Google's algorithm will rate it! Investing in SEO can do nothing but put more money in your pockets. 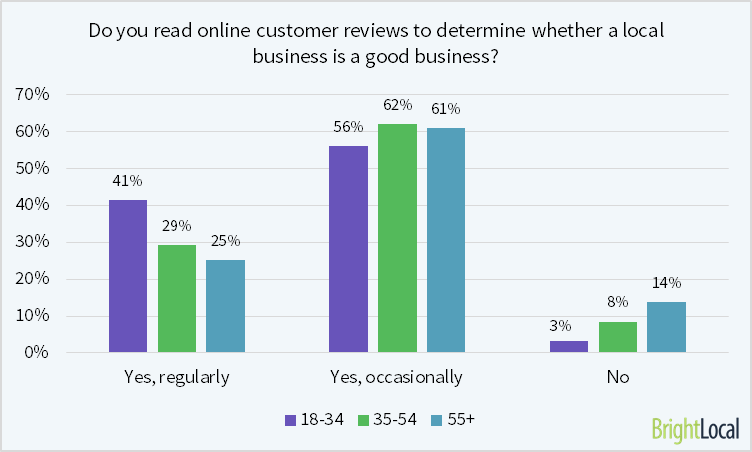 How do consumers of different ages respond to online reviews? "87% of consumers aged 18-34 have reviewed a local business on social media"
Following the release of the 2015 Local Consumer Review Survey, we uncovered some important information about how consumers think about, and interact with online reviews for local businesses. We learnt that 92% of consumers now read online reviews for local businesses (vs. 88% in 2014), and that consumers are forming opinions about businesses quicker than ever – with 40% suggesting they only need to read between 1-3 reviews (vs. 29% in 2014). But how can SEOs and local business owners use the survey data effectively? With so many variables at play we decided to take a deeper dive into the data to understand how consumers of different ages respond to reviews and if their attitudes differ. In this follow-up study, we breakdown the data by age bracket (18-34 / 35-54 / 55+) and see if younger consumers attitudes to reviews differ from older consumers. How many times have you used the internet to find / search for a local business in the last 12 months? There’s a clear difference in the search behavior of younger vs older consumers here. Younger consumers search more & more frequently for businesses online. 58% of this age group will search online for a business at least once per month, 45% will search once per week, and a whopping 21% will search online every day. So if you’re a business, or have clients, that target 18-35 year olds then it is vital to have a strong online presence. Almost half (48%) of this age group will search online between 1 & 10 times per year. They are not as active as the 18-34s but still 31% of them will search online every week. Perhaps unsurprisingly, the 55+ group are the least active searchers for local businesses online. Just over 1/2 of them will search online between 2-5 times per year, whilst 19% will either ‘never’ search or do it just 1 time per year. So we know which age groups are the most active at searching online, but do they read online reviews? Do you read online customer reviews to determine whether a local business is a good business? Consumers of all ages will read online reviews to some extent, and although younger consumers are the more regular readers, even 86% of the oldest age group (55+) either regularly or occasionally read reviews. So for businesses targeting all age groups, their potential customers are highly likely to read the reviews they have. Reading reviews is 1 thing, but how do they read these reviews and are they trusted by consumers? Which of the following devices / methods have you used to read reviews for a local business in the last 12 months? The data shows another big disparity between younger & older consumers. As expected, younger consumers are far more active on mobile devices – both mobile browsers & mobile apps. In the full survey findings we showed that 73% of all consumers had read online reviews on a PC. 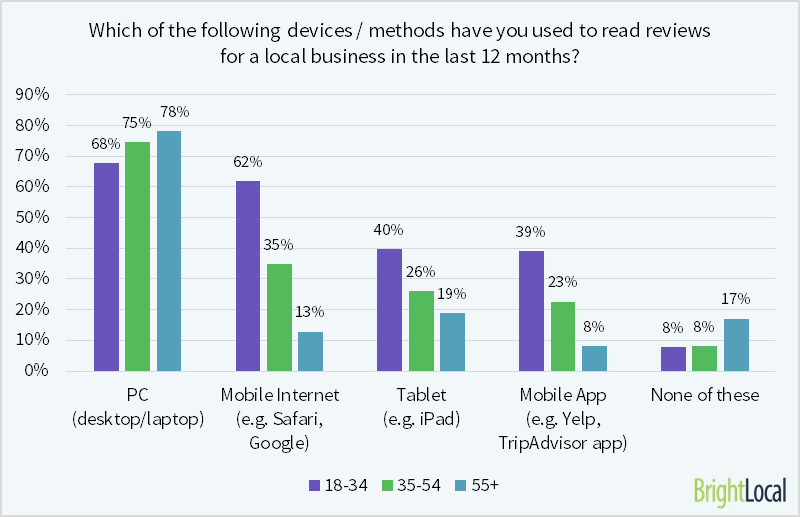 So the PC is still the most popular device for reading reviews – especially for older consumers and still (just!) for those aged 18-34. In the full survey, 38% of consumers had used mobile internet to read online reviews. We can see now that the vast majority of these consumers are in the 18-34 group. Those aged 35-54 are somewhat inclined to use mobiles to read reviews, but those aged 55+ rarely do. App usage follows a similar pattern to mobile internet, but review consumption is significantly lower. Interestingly, of all the mobile device options Tablets are most popular for 55+ consumers. Possibly they prefer larger screen sizes when searching / researching. We do know from countless pieces of research that this age group are not so wedded to their phones, so if they have a tablet they’ll reach for that device first. In the full survey, 80% said they trust reviews as much as personal recommendations, but 72% said they will only do so IF certain criteria are met. Now we can see that there is a correlation between age of consumers and the level of trust they have. Younger consumers are more likely to trust reviews vs older consumers. However that trust is not given freely and the vast majority of consumers (of all ages) will only trust online reviews if certain criteria around those reviews is in place – i.e. authenticity & quantity. How many online reviews do you need to read before you feel that you can trust that business? We saw in the Full survey findings that consumers are forming opinions about a local business faster than ever; 88% said they only need to read 1-10 reviews before they develop trust in a business. There isn’t a significant difference across the age ranges. A higher % of 55+ consumers read 0 reviews – this is because they don’t search online much and don’t read reviews at all. Because consumers of all ages are reading fewer reviews before forming an opinion about the business, it’s important for local businesses to not only have positive online reviews but also to ensure that they have regular, new reviews being written. In the last 12 months have you reviewed / recommended a local business to people you know by any of the following methods? 87% of those aged 18-34 have reviewed a local business on Facebook, Twitter, or Google+. But this figure drops to 50% for those age 35-54, and 24% for those aged 55+. Whilst social media is clearly a more comfortable medium for younger consumers, word of mouth is favored by those aged 55+ – and 67% of them have recommended a local business in this way. Overall, word of mouth and Facebook are the most common ways that consumers will review or recommend a local business, but the ratio of each will depend on the typical age group of customers. Younger consumers will use Facebook more, whilst older customers will prefer to verbally recommend a local business. 87% of those aged 18-34 have reviewed a local business on Facebook, Twitter, or Google+. So what does it mean for SEOs and business owners? well, consumers of all ages will review / recommend local businesses, but the means of doing so will differ depending on their age group / preferred method of communication. Ultimately, businesses need to ensure that they have a good presence on Facebook, Yelp, or other directory sites, but first and foremost they need to ensure that they are creating a good impression on the customer. The rest will take care of itself. 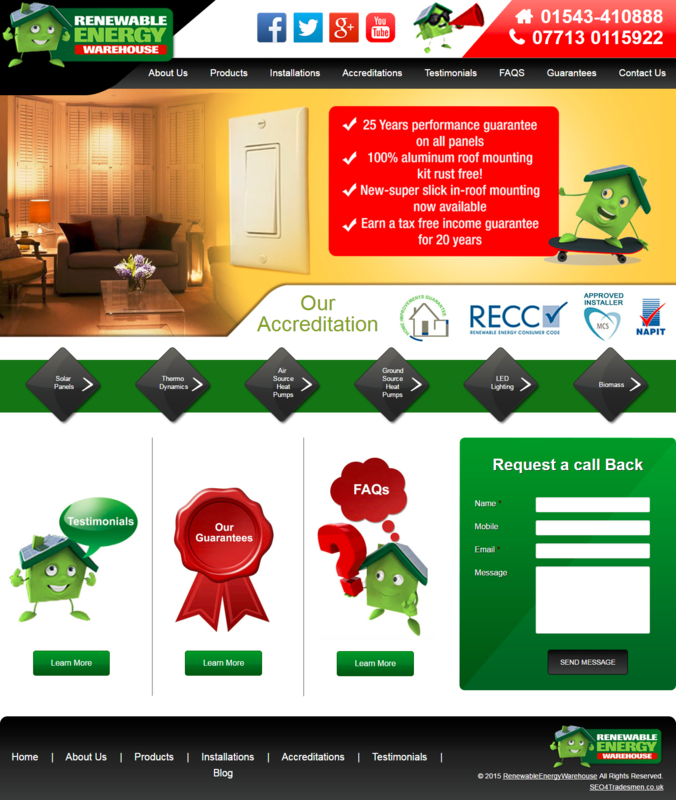 Do tradesmen need a website? Is internet marketing for tradesmen site important? I have noticed that more and more trades are now using websites as a major form not only to advertise but to brand their USP unique selling proposition. You are visible to potential customers who are looking for services like yours. As more and more people now look online for services as opposed to flipping through the papers and directories. It is much easier to just type into the search bar what you are looking for and instantly the results can be seen. Yes older methods of marketing still work but are limited to what information you can give. With a website it is like owning your own shop with all your products on view. Customers are looking for information about the service. The advantages of a website are many and in answer to the question does a tradesmen and tradesmen need a website well you can judge for yourselves the benefits. SEO for tradesmen website UK is a website that offers SEO optimization to a business site. This is done so as to raise the ranks of a business site in search engine rankings as well as make it easily visible in the top search results thus increasing the traffic in these sites as well as profits gotten from these sites. SEO optimized website that has been handled by professionals offers a lot of benefits to the site owner or business. With high rankings in search engines, your business website will get more traffic coming its way. This implies more sales for the business. So many other businesses are also on the internet trying to attract a clientele of its own. If your business is SEO optimized thus ranking among the top in relevant searches, you will have an upper hand over your competition as you will attract more traffic than them. This ensures profit optimization amidst heavy competition. SEO for tradesmen website UK is definitely the way to go in terms of SEO optimization for wonderful results from your business website.